I started writing computer code about 26 years ago in 1991. At that time it wasn’t easy to teach yourself how to code. The Internet existed but not in the way we know it now. It was much smaller, contained far less data, ran at much slower speeds, and the first graphical browser didn’t even exist until two years later. So how did nine year old me learn? Open source. Windows didn’t gain popularity for another year or so. MS-DOS 5.0 released that year though, with a couple life changing games. Nibbles was a classic snake game where the snake grows with each thing it eats and you work to avoid running into obstacles, the wall, or yourself. 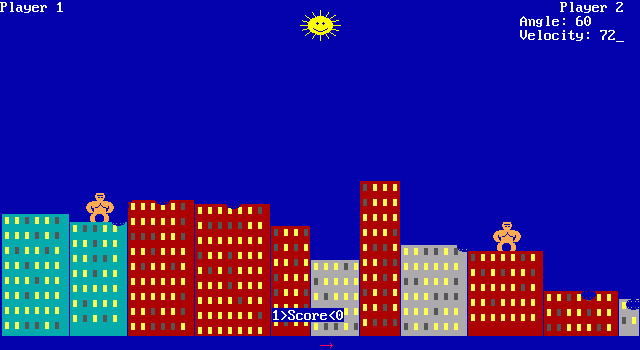 Gorillas was a turn based combat game of sorts, featuring banana throwing gorillas on a skyline. I played both games as most nine year olds might, bordering on obsessive, but it was the mathematics in Gorillas that really caught my interest. Each player took turns entering an angle and a velocity. Their gorilla would then throw an exploding banana accordingly. The goal was to hit the other gorilla, although the city scape could get in the way. You might have to explode though a building to get your opponent, or throw extremely high and hard to get the right angle to hit them without hitting a piece of the environment. Creativity was a part of it, but it was the numbers that really made it what it was to me. After a while though, the novelty wore off some. I got surprisingly good at judging angles and velocity and fewer and fewer people wanted to play against me anymore. That’s when a fun game became life changing. This is what you saw each time you played the game. “Press Shift+F5” to play was as user friendly as it got. 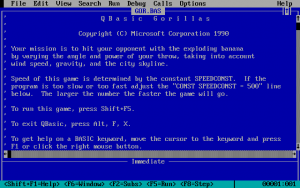 Gorillas and Nibbles were both written in QBasic, which is sort of a combination of the BASIC programming language, an IDE, a compiler, and an interpreter. 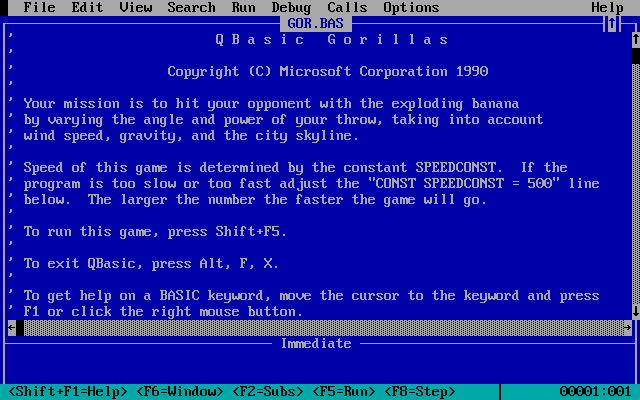 Meaning you could write code in QBasic and it was capable of executing it right there inside the editor. As a curious nine year old I scrolled down to look at the code that powered the game that I enjoyed so much. And I learned. There’s no way that I could have written either of those games at that time in my life. It took months before I could even convince my parents to take me around to book stores in search of resources. But I learned a lot from the code itself. I broke a lot of things, but succeeded in making the bananas behave differently, adding invisible obstacles, spawning the gorillas inside the buildings, and more. It was practically intoxicating! The POWER! It hooked me completely. Because of open source. In the early nineties I got into BBSs. First just logging into them to play “door games” (sorry young people, you’re going to have to Google some of this yourself) and eventually running my own. One of my favorite games was a MUD called Legend of the Red Dragon (L.o.R.D.). Being highly competitive, I found value in tracing through the code of the game and the in-game modules to find the secrets and tricks to be able to level up faster. My ability to understand code was now an asset to ten year old me. I learned a scripting language called “lady” in order to build my own modules. Existing modules, and their code, were my teachers. My BBS started to stand out as I added my own unique tweaks to a popular game. Enough that my parents noticed. And were none too happy with having three phone lines in our house, all of which were constantly busy. My leveling up in games through code didn’t end though. Chip’s Challenge was all the rage when I was twelve. My seventh grade class went nuts over it. It was a puzzle solving game wherein you overcame obstacles to collect keys. When you completed each level you were given a code to write down. You could use that code to start up where you left off. Everyone was in on the challenge and the codes were proof. I immediately tried to turn to the source code as a solution and was horribly disappointed to find out that I couldn’t. Open source had been so amazing, but it took a closed source application to really make me appreciate it. In order to do what I thought should have been easy, I had to learn about hex editors, earn codes manually, and use each new code I earned to slowly reverse engineer a compiled file. I was the first of my class with a full set of codes, but I was also now enamored with open source software. And it was a closed source game that pushed me that way. For anyone that knows what hex editors are or what it takes to reverse engineer compiled code, that last bit might have sounded a little crazy. For those of you that have no idea what any of that is, the correct response is roughly “how could you learn how to do that as a twelve year old in 1994! ?” The answer is that I had a mentor now. The summer before seventh grade, my parents connected me with the person that ran the computers for the school union I was in. I spent that whole summer learning under him. I continued to work with him through all of junior high. Even then, much of my learning happened from “open source”, although in most cases it was his source code. I learned the basics of Novell Netware scripting, more BASIC, C, and more. All by having the chance to look at various sources of code and ask him questions. As the Internet became more ubiquitous, I pushed back into open source. It was easier now. In 2000 I started developing websites for money and used only open source platforms. I knew better now. I knew that the easiest way to have the control I wanted was to be able to view and modify the code. In 2005 I made a pivotal decision; I moved to WordPress development. In 2007 I started to contribute back to the project. It hooked me again, and I’ve been happily contributing to and advocating for open source ever since.